I've included a selection of extra photographs here, some of which are alternate takes to those that made the blog, with some highlights from each month. Hope they whet the appetite to explore in the new year! January: Dad (78 this year) enjoying himself inside Weathercote Cave. January: Sunlight streams down the shaft, showing the old man's face to the right of the waterfall, Weathercote Cave. January: Dad trying for the perfect shot. January: Dad waves to me from a precarious position next to 'Mohammed's Coffin': following in the footsteps of Victorian tourists, Weathercote Cave. January: Going back in time with a black and white image of dad in Weathercote Cave, Chapel-le-Dale. February: Lucy descending the upper reaches of Ingleborough, in arctic conditions. February: Ingleborough and the Falls Foot Landslip (right) from the drift covered limestone bench. February: Joseph on the Ingleborough summit ridge. March: Victoria Cave - above Settle. 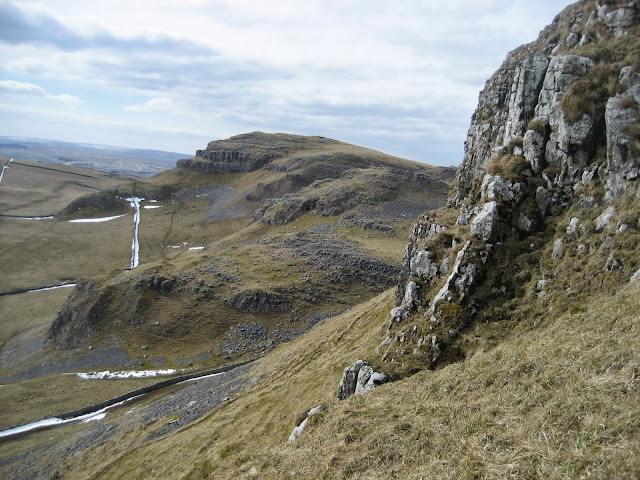 March: Warrendale Knots from Attermire Scar, Settle. March: Horseshoe Cave, Attermire Scar, Settle. March: Icicles on Victoria Cave. April: Joseph outside the impressive Attermire Cave - used for burials in Romano-British times. April: Heading into the 'Horsecollar' - Attermire Cave. April: Lucy tackling the first part of the 'Horsecollar'. April: Lucy and Joe exploring the passages beyond the pool chamber, Attermire Cave. April: The signature of Tot Lord, the man who discovered the Celtic chariot, in Attermire Cave. April: Lucy and Joe in the entrance to Attermire Cave, close to where the chariot was discovered in the 1920s. How laid back can you get? April: The impressive position of Attermire Cave, high up on the limestone scars above Settle. May: Park Fell and Ingleborough from Gearstones. May: Limestone pavement and woolly companions at Ribblehead. May: Limestone boulders deposited by ice, Thorns Gill. May: Beautiful pool and cascade in Thorns Gill. May: Glacier-deposited limestone boulder, Thorns Gill. May: Viking kitchen at Gawber, Ribblehead. May: Inside Katnot Cave, Thorns Gill. May: Foam inside Katnot Cave, caused by chemical reaction when water from peaty moorlands sinks into the limestone. May: The Katnot Cave chipmunk or squirrel. May: Stalactites, moonmilk and flowstone curtains in Katnot Cave. May: Vadose canyon passage in Katnot Cave. May: Limestone boulders on Newby Moss, Ingleborough. May: Boulder bridge over a narrow part of the Fluted Hole, Newby Moss. May: Beautiful fluted columns of pink limestone in the Pillar Holes, Newby Moss. May: The Boggart's Roaring Holes - Ingleborough. May: A pint in the Old Hill Inn. May: Ingleborough from behind the Old Hill Inn. May: Egg sac of cave spider in the Boggart Holes, Ivescar. May: Cascade inside Homeshaw Cave, on the lower slopes of Whernside. May: Evidence of former water action in Homeshaw Cave. May: Stunning teardrop-shaped vadose passage in Bruntscar Cave. May: Cascade in Bruntscar Cave. May: Classic formations in Bruntscar Cave. May: The lovely Gatekirk Cave, Chapel-le-Dale. May: The main waterfall inside Gatekirk Cave. May: Cave pearls forming inside Gatekirk Cave. May: 'The Tomb' inside Gatekirk Cave, where the rocks give the impression of a range of deposited bodies and belongings as would be expected in the Valley of the Kings. Note the beautiful scalloping of walls and floor by water action. May: The main stream passage in Gatekirk Cave. June: Cascade and pool near Calf Holes, Ribblesdale. June: Rock sculpture near Birkwith Cave. June: The wild ravine of Ling Gill. June: Waterfall in the depths of Ling Gill. June: Joints and bedding planes in the Great Scar Limestone of Ling Gill. June: Pool catching the sunlight, Ling Gill. June: Rock sculpture inside Ling Gill, Upper Ribblesdale. Enjoy a happy and peaceful Christmas and New Year.